Jon Jones Weighs in on Daniel Cormier Fighting Brock Lesnar; Who Wins? Jon Jones has been teasing a move to heavyweight. Is he targeting a potential third fight with Daniel Cormier? While Jones has been on the sidelines dealing with an anti-doping violation for more than a year since his last fight, he has often posted videos and made comments that lead to an eventual move to heavyweight when he returns. Jones has fought Cormier twice. 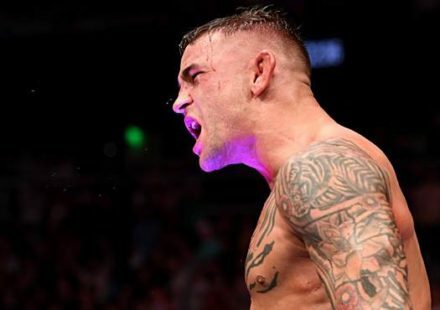 He defeated him both times, but was popped for prohibited substances after their last fight at UFC 214 in July of 2017. He has since been undergoing the adjudication process. Signs have pointed toward Jones’ return sometime soon, though it has been months since his manager said that they were hopeful a resolution was forthcoming. Cormier, meanwhile, was reinstated as the UFC lightheavyweight champion after Jones was stripped of the belt because of the anti-doping violation, and then went on to defeat Stipe Miocic to claim the heavyweight title. Cormier is now only the second fighter in UFC history to hold two belts simultaneously. Conor McGregor was the first. Jones thinks that Cormier appears to be a more challenging force at heavyweight, but doesn’t think even a heavier Cormier has what it takes to defeat him. “I think fighting Daniel Cormier at heavyweight would be a bigger challenge. He’s more comfortable there,” Jones told Russian journalist Alexander Lyutikov. “His body type… that’s the way he wants to be, to be big. I think he definitely will be a tougher fight at heavyweight. There is a good chance that Cormier will be retired before Jones returns. Cormier has put a self-imposed deadline of his fortieth birthday on his career. That date lands on March 20, 2019, and he already has at least one fight lined up, possibly two. Cormier has said he would like to defend his light heavyweight belt again, which would likely come later this year. What he believes will be the final fight of his career is a heavyweight title defense against Brock Lesnar in early 2019. Should that scenario play out – unless Jones is the challenger in the light heavyweight defense – Jones could be out of luck. Though he might not ever get another crack at Cormier, Jones has definite thoughts on his foe’s UFC heavyweight title defense against former WWE Universal Champion and former UFC champion Brock Lesnar.